In today’s society, water is available in a seemingly endless abundance. Access to clean water for everything from personal health and hygiene to recreational use seems to know no bounds. Water is such a commonplace resource that we even throw it away without much thought. To address this problem, some private companies and municipalities are working with a public-private partnership model, under which municipalities can identify longstanding concerns with their systems and prioritize projects that need immediate work. More municipalities are finding that private utilities have the needed capital resources required to update infrastructure and are in the financial position to invest resources in improvements to update aging systems. According to a study by Public Works Financing, private providers save municipalities an average of 17% in costs through operational efficiencies under a public-private partnership. Each day, almost 73 million Americans—about one in four—receive water service from a private water utility or a municipal utility operating through a public-private partnership. Private utilities often serve customers who do not have many—if any—other options, such as those living in rural areas. There also are public health benefits attached to privatization. According to EPA records, in the past five years there were 5,808 public health-related Safe Drinking Water Act violations. These violations can include exceeding maximum contaminant levels for regulated substances or the failure to disinfect water properly. Only nine of these violations took place at facilities operated by investor-owned utility companies. Still, it can be difficult to dispel misconceptions about rate increases. Rates are designed to give private utilities the opportunity to recover reasonable and prudent costs for providing service, and a reasonable rate of return on money they have spent on the infrastructure that provides the water and wastewater service. State utility commissions not only establish utility rates, but also closely review a utility’s rate request to ensure money is spent prudently. This means that utilities can only recover costs for projects that are necessary to serve customers and comply with state and federal health and environmental laws. The Emlenton Water Co. in western Pennsylvania is an example of a successful private utility acquisition. The 1,200 customers of Emlenton Water Co. had been under a Pennsylvania Department of Environmental Protection (DEP) boil water order for seven months prior to the system’s acquisition by Aqua Pennsylvania. 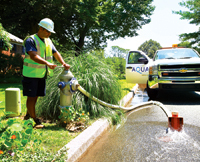 After purchasing the system, Aqua Pennsylvania entered a Consent Order Agreement (COA) as a commitment to the Department of Environmental Protection that the problems it inherited from the Emlenton Water Co. on Dec. 31, 2008, would be resolved on or before July 1, 2012. Aqua Pennsylvania had been operating the troubled utility as its certified operator under an emergency order from the Pennsylvania Public Utility Commission (PUC) since Nov. 21, 2008. The system had been brought to the attention of Aqua by the PUC, which had classified it as a “troubled” water system. During its tenure as operator, Aqua Pennsylvania has provided a certified operator to run the plant, and a water tanker truck and bottled water for customers’ potable water needs, including during the extended Thanksgiving weekend. 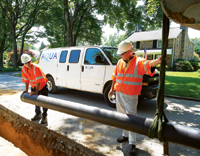 After acquiring the system, Aqua made temporary improvements that allowed it to lift the boil order in 23 days. In February 2011, following two years and $4.5 million of capital investments in the system, Aqua had satisfied the requirements of the COA 17 months ahead of the deadline. Specific improvements made to the Emlenton water system over two years included $2.8 million for construction of a new 288,000-gal-per-day water treatment plant; $925,000 to replace 11,400 ft of old water main; and $392,000 of improvements to the existing finished water reservoir, including the installation of a dome roof. In July 2012, the Emlenton system celebrated its membership in the Partnership for Safe Water, a voluntary cooperative effort between EPA, the American Water Works Assn. and other drinking water organizations representing more than 200 surface water utilities throughout the U.S. Emlenton’s participation in the partnership represents a 180-degree turn for the facility, which just a few years earlier suffered one of the longest boil orders in Pennsylvania history. Karl Kyriss is executive vice president of Aqua America. Kyriss can be reached at [email protected].